Zoe Hazlitt went missing many years ago, but her mother continues to hope. 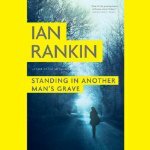 Now this hope is based on a new missing young woman and going on that fact she gets the attention of Rebus, retired but working on cold cases. Rebus isn’t sure about taking this on until a photograph shows up and it stimulates something. And then they realize that several other girls have gone missing over the years from the same general location. Are there other connections? What would they be? As Rebus kind of pokes around he drinks and drinks and smokes and smokes and talks and talks – he frequently listens to some music. No rush – always honest – everything explained. The hardest thing about this book was the accent of the narrator – I’m really not tuned in to that particular brogue – it takes considerable attention on my part to figure out what the guy is saying and then to put it together with what else I have been hearing. I read another Rebus book (The Resurrection Men) not too long ago and wasn’t all that impressed with it, although it seemed like it was better than this one. Perhaps I should have known better than to try again but the premise here sounded like it was worth trying. If you’re a Rebus fan you might love it.